A job seeker holds an employment flyer during a hiring event at an Aldi Supermarket in Darien, IL in July. Illinois’ economic outlook is improving by one measure. According to two reports on the state's labor force, Illinois added nearly three thousand jobs in September, while unemployment across most regions has fallen or remains low. The latest numbers come from an October report done by the University of Illinois' Regional Economics Application Laboratory, or REAL. It shows the job additions last month are part of a larger trend: more than 50,000 workers are on the job in Illinois compared to a year ago. 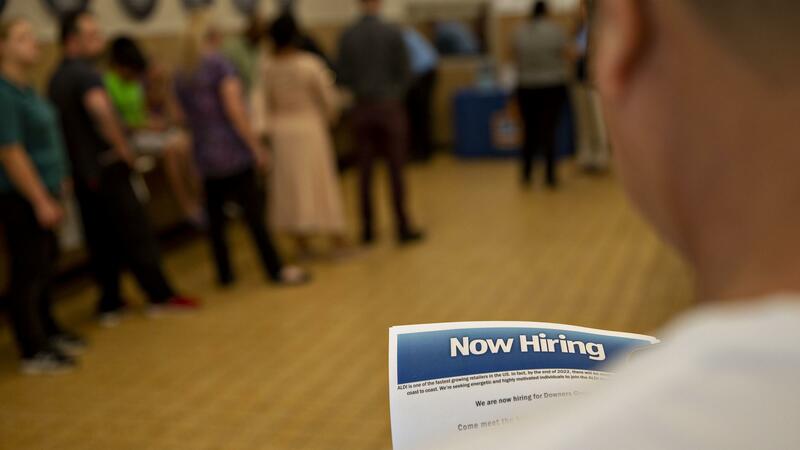 The state’s jobless rate remains at about four percent. Overall though, jobs are growing at only half the national rate. REAL Emeritus Director Geoffrey Hewings says the good news should be greeted with caution. “There are a lot of people who are still not being able to find jobs, and they have stopped looking," Hewings explained. "So, they’re not counted." Official unemployment data also does not count those who are trying to move from part-time to full-time positions. "Of course, that has huge rebounds on the state’s fiscal condition," Hewings explained, "because if people are not employed, they’re not paying taxes and as a result we’re missing opportunities in terms of revenue." Even so, Illinois’ Department of Employment Security says there’s still good news. Its own September jobs report showed unemployment filings last month were at their lowest level in more than four decades. According to IDES official data, unemployment rates have slightly improved from a year ago in nearly every Illinois metro area.